Just watching this to say I’ve nearly seen every Stanley Kubrick film. Nothing to see here. 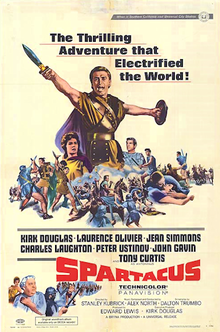 “Spartacus” is also one of the films to basically end the “Blacklist”-era of Hollywood by openly showcasing Dalton Trumbo’s name as the screenwriter even though he was a blacklisted writer. Douglas openly admitted that Trumbo wrote the script and “Spartacus” went on to be one of the highest grossing films of 1960, showing that Hollywood needed Dalton Trumbo. So while the film started out as a petty way for Kirk Douglas to get back at the executives that turned him down for a role, it did end up saving the careers of hundreds blacklisted writers, directors, actors and filmmakers. A true showcase of selfishness becoming selflessness. That being said, “Spartacus” is about as average of a Roman epic as you can get. We see the slave uprising, the evil greed of the Roman Empire and their need to suppress everyone around them, the leader of the slaves being very stoic and showing his men kindness instead of the hatred the Romans showed, and so on. Outside of the now famous “I’m Spartacus!” scene, I have a hard time remembering most of the plot. I find the story of how “Spartacus” was made more interesting than the movie itself.